The Lake is situated on what was a flood-plain, and on the flooded territory of the River Tisza. In between water dams, there are sixteen islands and ten water channels. The shallow water areas, which warm up easily, are suitable for bathing. Ab�dszal�kThe deeper parts are for water sports such as sailing, water skiing and surfing. 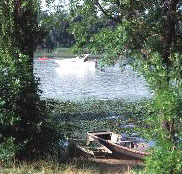 Lake Tisza is also the only Lake in Europe where you can speed around by powerboat and jet-ski. Along the riverbank (approximately 50 miles) there are recreation areas, open-air baths, camp-sites and places to hire equipment. 5350 Tiszaf�red, Kossuth t�r 1. Ab�dszal�k, at the southern corner of the lake, is a sport and recreation paradise. On the huge water surface of the Ab�dszal�k Bay, fans of powered sports devices can speed freely. The Puppet Museum in the Village House, with more than 250 puppets in folk costumes of the Carpathian Basin, is a fascinating experience. Lake Tisza On the right shore of Lake Tisza is one of the most spectacular holiday areas of Tiszan�na. The Dinny�s Ridge is known for its pleasant bays, backwaters and smooth open-air pools. Landscape artists are actively shaping the landscape, in a way that is sympathetic to the surroundings. They are setting up wonderful parks, fishing sites and new recreation areas. Lake Tisza Visitors can learn about the ethnography of the region in the Village Museum of Kisk�re, a place noted for its garden parks. The varied summer program is enriched by majorette, Roma gypsy and folklore festivals. Thousands of anglers and lovers of delicious fish dishes are attracted to the angling waters of Poroszl� and Sarud, by cat-fish in spring and by pike in the autumn. Berekf�rd� is a pleasant, family-friendly recreation area. Its Thermal and swimming baths have an indoor thermal spa with two pools and an open-air spa with seven pools. The town glass factory is world-famous. Its frosted glass is made using an original technique which produces a pattern of hairline surface cracks. Products are on display in the factory's exhibition area. Karcag is a typical market-town of the Great Plain. Potters, quick-fingered lace-makers, folk artists of felt coat embroidery, cooks preparing excellent mutton-paprik�s and women baking Karcag cake, made this town famous. The history of the region and its rich folk art can be seen at the Gy.rffy Istv�n Nagykun Museum and in the Regional House of the Nagykuns�g, a traditional Cumanian (Kun) peasant house. The works of the most significant potter folk artist, S�ndor K�ntor, recipient of international and domestic prizes, is exhibited in the Pottery House. 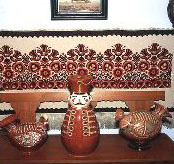 Among his exhibits are the typical Miska jugs of Karcag. At the southern entrance of the Hortob�gy National Park is the Windmill Reception House with the special flora and fauna of Hortob�gy. Nearby stands a 19th century windmill, the only one remaining out of an original sixty. 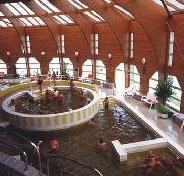 The thermal water of the town can be enjoyed at the open-air bath and swimming-pool. Tiszacsege`s most valuable asset is the 81 �C thermal water springing from a depth of 1150 metres, suitable for easing rheumatic and muscular pains. 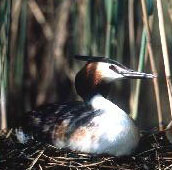 The K�csa (Duck) Island is a protected area, where the rich flora and fauna of the Tisza Region survive untouched. The Dayman House presents the typical way of life of the region. On the picturesque Tisza river, the Csege motor ship takes passengers to Tokaj or Kisk�re. Bird reserve Tiszaf�red is one of the most popular recreation areas of Lake Tisza.Water lilies decorate the backwater of the Tisza. The smooth sand of the river beach and the frequently changed water of the open air baths and thermal bath offer pleasant bathing opportunities. The first village museum of the country was established here in 1949: the Kiss P�l Museum, exhibiting the typical "F�red saddle" of the shepherds of the Great Plain. In the Pottery House the workshop of the most famous F�red potter dynasty can be seen. The Meggyes Cs�rda Museum (Tiszaf�red-K�cs�jfalu) is the only authentically furnished and restored `Hortob�gy cs�rda` (restaurant) with open chimney. Large and small white egrets, spoonbills, black cranes and the very rare lanner falcons are permanent inhabitants of the near-by, strictly protected bird reserve. Tisza�jv�ros Tisza�jv�ros, at the junction of the rivers Tisza and Saj� is only 30 years old. The ice-rink here is open winter and summer. One of the most modern thermal baths, an adventure bath equipped with the latest technology, and an open-air bath welcome guests. 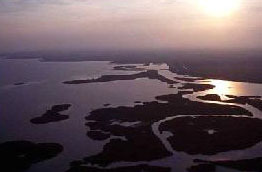 The bird reserve of the Tiszavalki Basin is a strictly protected area, is home to more than a thousand pairs of herons, egrets, night herons and cormorants. The visitor who takes part in a river tour starting from any of the 15 ports will enjoy the calming and refreshing experience of this romantic water-world.